Yukari wants nothing more than to make her parents happy by studying hard and getting into a good college. One afternoon, however, she is kidnapped by a group of self-styled fashionistas calling themselves "Paradise Kiss." Yukari suddenly finds herself flung into the roller-coaster life of the fashion world, guided by George, art-snob extraordinaire. In a glamorous makeover of body, mind and soul, she is turned from a hapless bookworm into her friends 22 own exclusive clothing model. 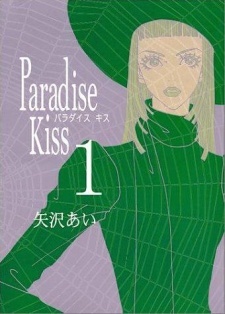 Paradise Kiss was published in English by Tokyopop from May 21, 2002 to March 9, 2004. Due to Tokyopop dissolving, Vertical Inc. acquired publishing rights to the series and republished the entire series into three volumes from September 25, 2012 to March 5, 2013. Yazawa's art is just as stylish and edgy as in &quot;Nana&quot;, but with a higher concentration on fashion and &quot;style&quot;. It is a highly emotional story, full of the troubles associated with following your own path in life, and living accordingly. Yet, there is a self-awareness incorporated in it, with characters commenting about their presence in the storyline and whether or not there are enough pages for them. These comedic touches help the readers to not get bogged down in what could just be one angsty read. If your like me, you probably like deeper mangas then the ever so cliche tale of a innocent high school girl who falls in love with the nice guy and then falls in love with the guy who she has constantly insults while he is chasing after her. It scares me too how I kind of got the gist of most shojo mangas (Although, I must say that to those kind of stories, Im addicted ^.^). Anyway, Paradise kiss is about this unwelcoming, smart, attractive, and tightly wound girl, yukari, who meets her fate when a student of a fashion school asks her to model for them in the next fashion show. When she finally accepts, she meets George a handsome designer and the head of the "Para Kiss" clothing line, Miwako who works with george and wants to start her own fashion line like her sister, Arashi who is miwakos boyfriend and plays in a rock back, Isabella who is the "mother" of the group, and Tokumori Yukaris friend at school. The events that happen are unpredictable, the story is well said, the characters are appealing, and the art is captivating! I really enjoyed this and you might too. Paradise Kiss is a josei manga written by the mangaka of the famous Nana. It is apparently a sequel to a previous work of hers, Gokinjo Monogatari, which I wasn't aware about until after I already started reading (oops). This is only my 2nd time reading a josei manga (shoujo reader all the way), but I still found this one quite enjoyable. Yukari is a senior in high school who has known studying all of her life. One day, however, she is kidnapped by a group of fashion designers who believe that she would be the perfect model for the next fashion show. Even though she is reluctant to participate at first, Yukari becomes interested in these designers, and also intrigued by their leader, George. She eventually becomes immersed into the fashion world and believes that it is her true calling. Is it possible for her to include both fashion and academics in her life, or can she only choose one? And what kind of person is George, really? The art for this manga was very well-done and good at depicting comedy and maturity when needed. It also was very detailed when it comes to fashion, which I love. The characters were so-so for me. I liked Yukari originally, but found that later she seemed impulsive when it came to important decisions she had to make. I think she could've been more sensible. Also, at times her feelings for George were a bit much, and I was unsure about whether she wanted to continue fashion because of passion or because of George. George, on the other hand, I liked even less. He kept a lot to himself and didn't provide Yukari any help when she had problems. I liked the minor characters much more, but I would've liked to learn more about them. Overall, the manga was an enjoyable read. I always like manga where the protagonist is trying to find him or herself. I would also recommend this to those who like realistic manga and romance. The manga is also mainly about fashion so if you like career-oriented manga, you'll probably like this one as well. Also, the ending was superb. For the manga I think it has a good story line and it keeps on rolling forward and does not stall I am disappointed in the ending I thort that it could have be better. Like she could have got back with George after wearing some of his close for a shoot or samthing but overall it was a good read. Is this different from the anime?